Prized for its sweet, rich and buttery flavored meat, the blue crabs scientific name is Callinectes sapidus meaning "Beautiful swimmer that is savory"( Calli-beautiful, nectes-swimmer and sapidus- savory). The tinges of blue on the dark shell and the blue patches on the legs is what gives these wonderful crab their name. Compared to King or Snow crab, the blues are extremely small averaging only 4 to 6 inches across. Male blue crab will grow larger than the females. The point to point width of some males can reach 6 to 7 inches. The claws on the male crabs will be blue, while the female's claws are orange-tipped. The male blue crabs are nicknamed "jimmies" , the immature females are called "sallies" and the mature females are referred to as "sooks". Although found in waters from Cape Cod to the Gulf of Mexico, the majority of blues will be found in the Chesapeake and Delaware bays off of Maryland and Virginia. The same species of blue crab "sapidus" can be found in Central and South America. Blue crabs are sold in many different ways. First you have the live which can be steamed or boiled and eaten right away or the meat can be used in soups or salads. When buying live blue crab make sure the the crabs have some movement in the legs, throw away any dead crabs or crabs that have broken shells. If storing the crabs in the refrigerate, make sure you place them in a breathable container such as a onion sack or cardboard box. Never store your crabs directly on ice or let them submerge in water as they will die very quick on you. Chilled crabs may look dead to you, due to the lack of movement. But after you remove them from the refrigerator or ice cooler, you should see some movement as they warm up. Soft-shell crabs are harvested right after the molting, these are best cooked by frying, grilling, broiling or sautéing at a high heat to crisp up the shell. You should be able to find soft-shells either live, fresh or frozen. If you buy fresh soft-shells make sure to refrigerate them and cook them within 2 days. Most of the blue crab you might find will be already cooked and picked out of the shell for you. 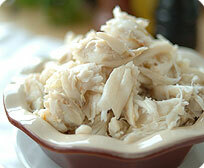 You will find cooked crab meat offered by Jumbo lump, Backfin lump and Claw meat. Store your fresh blue crab meat on ice and in the coldest part of the refrigerator and make sure to use it within 7 to 10 days. The sooner you use it the better. Jumbo lump is the premium meat from the blue crabs back section. These jumbo lumps of white meat are your best bet when the appearance of your crab dish is important. Backfin is the meat which is picked out of the backfin of the crab. Although still white in color this meat will be flaky and less shapely compared to the jumbo lump. This meat is great for crab cakes, or any recipe calling for blue crab meat. You can also find pasteurized meat which is firmer and darker than fresh crab. A good rule of thumb is to serve 3 to 4 whole crabs per person. If you are just serving the blue crab meat the serving size should be about 1/6 of a pound. Preparing and cooking blue crabs is very easy. Make sure to keep your crabs alive before cooking by keeping them cool and dry. You can do this either in the refrigerator or in a cooler with a small amount of ice. Steaming (not boiling) is a perfect way to cook your blue crab. To steam your blue crabs you will need a large double boiler. And enough water to the lower pot and then put your crabs in the upper pot. As you layer your crabs, season them with your favorite seasoning I prefer Old Bay seasoning. Another way to season your blue crabs is to make a pot of cool seasoned water and then once your crabs are cooked, place them in the water and let the seasonings soak into the crabs. This helps the crabs from becoming over cooked. A good rule of thumb is to steam your crabs for about 20 to 30 minutes. On occasion you might find some small black spots on your cooked crab meat. This is called pepper or buckshot; these are tiny parasites that are common in blue crabs. The parasites are not harmful to eat but a heavy infestation of them can reduce the quality of the meat and make it unappealing. Snow Crab, King Crab or Lobster meat.